There are different approaches to therapeutic counselling which broadly fit into one of four schools, developed over time. The first is the psychodynamic approach, which was pioneered by Sigmund Freud. In this approach the therapist (or 'analyst') interprets the client's experience and is the 'expert' in the room. The stereotypical image here is of the 'patient' on a couch with the psychoanalyst seated behind, making notes. The second, behaviourism, was developed by B.F. Skinner and asserts that we are born as 'blank slates' and learn our behaviour in response to our environment. Cognitive behavioural therapy (CBT) comes from this, and involves correcting erroneous or unhelpful thought patterns in order to overcome difficult feelings. The next school of thought is the humanistic tradition, of which the person-centred approach (PCA) is a part. Lastly, the 'fourth force' in psychotherapy is arguably the transpersonal school, which emphasizes the spiritual element of a person's experience. The choice of different therapies on offer can be bewildering for someone seeking psychological support, especially at a time when they could be experiencing personal distress. Research shows that many people have been assisted by approaches stemming from each of the four schools, and the selection of one type of therapy over another is down to personal preference. So, how then to choose a way forward? The one consistent beneficial factor reported by those researching effective counselling is the quality of the relationship between client and counsellor (see, for example, a report into the effectiveness of counselling by Professor Liz Bondi for the organization Counselling & Psychotherapy in Scotland (COSCA) at www.cosca.org.uk/docs/0311-29-11.doc ) The deciding factor in the outcome of therapy is often the strength of the alliance between therapist and client, independent of counselling approach. 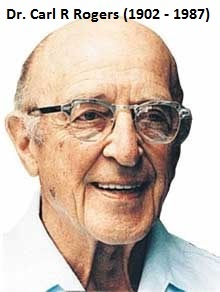 I chose to specialise in the person-centred approach, founded by Dr. Carl Rogers, as I feel that it is this approach over all the others which values the equal, balanced relationship between counsellor and counselled the most. In the PCA, the 'expert' in the room is the client themselves - after all, who best to know what it's like living the life requiring exploration than the person living it? A CBT-based approach can be delivered by a computer software package, which leaves zero scope for a personal relationship, while the transpersonal style is perhaps difficult for those who do not have an interest in spirituality. It is my privilege to share in the lives of my clients and to get a window into their world while they are in therapy. It has been my experience that the transformative power of the therapeutic relationship is a two-way process, and in the client learning how to overcome difficulties and live in a more fulfilling way I too have gained both in a professional and personal sense.